Bowling for Soup is a punk rock band that was formed in Wichita Falls, Texas in the mid 1990’s. They are best known for their hit singles “Girl All the Bad Guys Want”, “1985”, and “Almost”. They are also well known by a generation of kids as the band that sang the theme song for the Disney TV show Phineas and Ferb. Their song “High School Never Ends” is off their ninth album, The Great Burrito Extortion Case, and was released in September of 2006. Bowling for Soup arrives at their high school reunion. The song is about the frustration of graduating from high school, and realizing that modern pop culture is very similar to the obnoxiously superficial and materialistic culture in high school. The lyrics reference many celebrity scandals from the 2000’s to show how gossip obsessed modern society can be. This highlights how the people in your life may change after high school, but cliques and popular kids will always exist in society and they’ll always try to stand in your way. The important thing is to move past them, and be better in the long run, as the band goes on to do in the music video. Walking into your high school reunion as a world famous rock band has got to be a great feeling right? 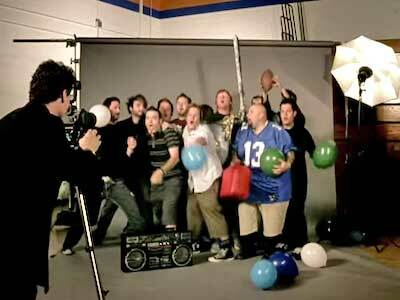 The music video begins with younger versions of Bowling for Soup performing their hit song “1985” while trying out for their high school talent show. They get rejected and are accosted by the stereotypical jocks on campus who call them losers. Bassist Erik Chandler says that everything will be different once they’re done with high school, and with that, the video fast forwards to their 20 year high school reunion where the band is playing a set for their former classmates. They spend the night rocking out and getting revenge on those that wronged them when they were in high school. There is a nice touch of lead singer Jaret Reddick wearing the same black high top chucks as both a young teen and as an adult. It’s a funny video that plays into the fantasy a lot of people have of showing up their high school bullies at the reunion, and it fits in with the song’s lyrics really well. The band poses for pics with their old marching band. Click on the links below to get a new pair of chucks to wear at your high school reunion.